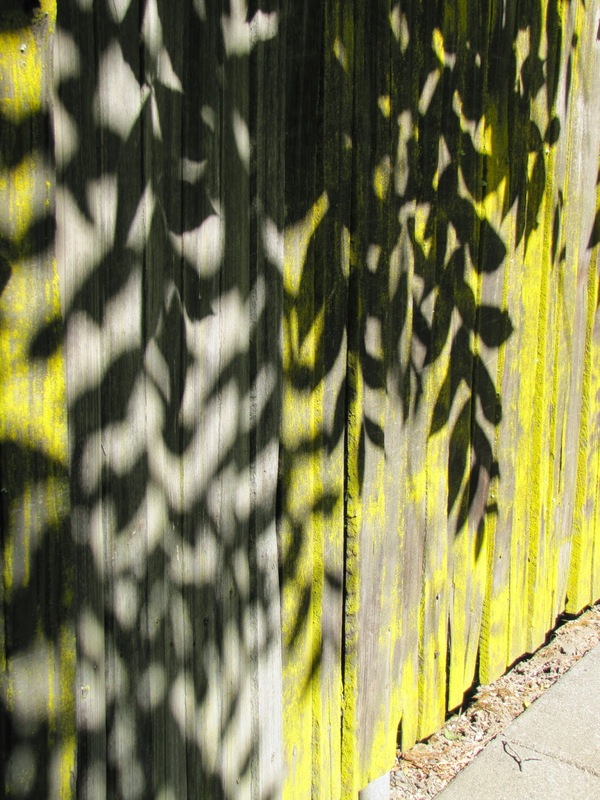 As I walk around the block in the morning with pup I pass a fence covered with moss, tipped with nails and shadowed with leaves. If I pass this same fence in the evening I notice the uneven boards warped by time, the sound of the stream and the sense that all is not well behind this tall forbidding fence. The casting of shadows is what makes the difference in the morning. The patterns of leaves mark the long fence in interesting and sometimes amusing ways. Mustaches of shadows. All of us cast shadows. I like the word "cast". I picture an arc of motion, a projection moving high through space, an optimistic sling of hope. "Cast" has a sense of intention. Casting anything at all carries some measure of success. Casting off clothes, casting a fishing lure, casting a line to rescue someone. The motion alone denotes action. Prior to my passing the shadowed fence there is a group of large boulders sitting in an elegant garden by the sidewalk. One almost sees the shadows on the rock before one notices the leaves casting them. We all cast shadows. Maybe that the shadow is on a rock, unmoving and solid that makes me forget the motion of casting. The shadow is so lovely that I want to touch it. Casting a shadow has become an idiom for causing harm. This leaf looks like it could have caused a ruffling of intermittent harm. Small acts of irritation. Recalling the long shadows of the tall and narrow cypress trees, I think about the intentional acts cast with hope of harming someone. I am sad that the lighthearted motion of "casting" has become tainted with such unfortunate meaning. Casting harm can have long term wrenching consequences. Casting a shadow that doesn't easily fade any time of day or even any month or year is a shadow of haunting proportions. Ever the optimist I try to sift through the ways to recast shadows, to teach someone the ways to cast more carefully, thoughtfully and lovingly. Some sadly never learn. This generation to that generation casting lessons can cause such harm and hold such darkness. As I deal with people whose shadows cause grief and who refuse to recast in more lighthearted ways, I pity them. Behind the fence I heard a dad ordering his child to leave the sun dappled yard and come in to watch cartoons. As she ignored him engrossed in childhood play, his voice got more threatening and angry. Long shadows behind a forbidding fence. Quite potent and thought provoking. Words cast shadows - the father's angry voice. Makes me think about what light casts or evokes.